4:45 – The results are finally in. With 52% of the vote, Ben Cline has won a majority in the first ballot. Numbers for the remaining six candidates were inaudible as a huge cheer went up in the room, so I will try to get the full numbers soon. For the 6th District Chairmanship, Jennifer Brown won with a solid 58% of the vote. In the final contested race of the day, Jonathan Comer won an incredibly close race for Northern Regional Vice Chairman over Steve Kurtz by 50.01% to 49.99%. Congratulations to all the winners, and a thank you to all the candidates who ran. On to victory in November. 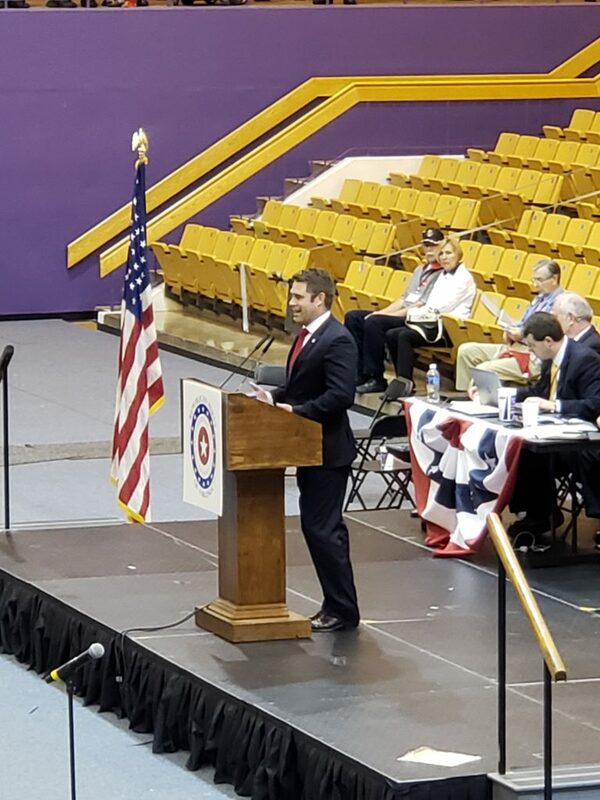 4:10 – Rounding out the trio of candidates is Nick Freitas, who started his speech with his military background and finished with a call for everyone to stand up for liberty and to reject the victimhood mentality of the left. 3:55 – Next up is Corey Stewart, stressing his record on illegal immigration and highlighting his connection to the Charlottesville Statue issue last year. 2:55 – We’re still voting in the first round and I’m bored, so I thought I would give you some interesting tidbits. The only two areas in the 6th district that are overfiled are Rockbridge are a and Rockingham county. These are both Cline heavy areas that provided sizable raw votes for Jack Wilson for convention Chairman. However, because more people are here than total delegate votes, each person’s voting strength is diminished in the weighting process. 2:30 – After about a 30 minute delay the ballots for the first round are now being distributed. 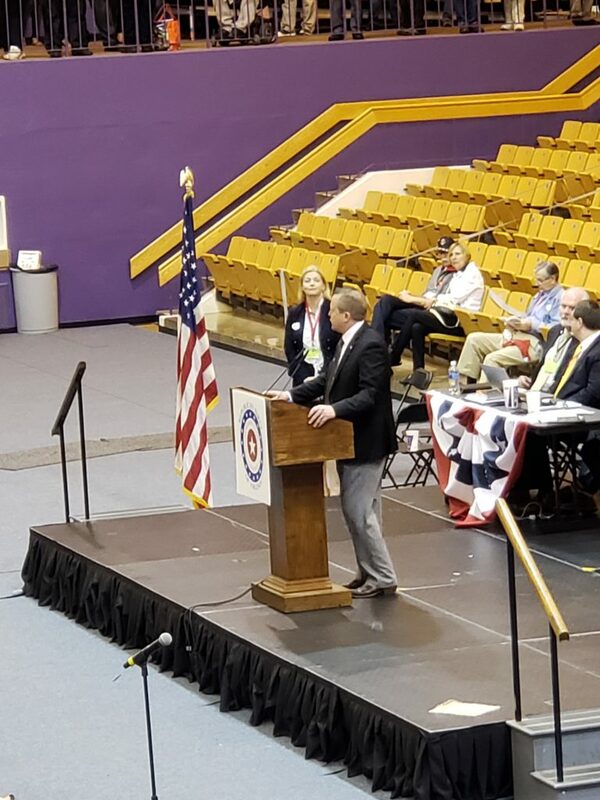 The final credentials committee report was put forward with a unanimous vote of the committee, with essentially all challenges being withdrawn, and 124 additional delegates added to the rolls for total of 2234 credentialed delegates. 1:50 – The speeches have finished and the balloting for the first round will soon begin. Cynthia Dunbar finished the speeches for Congress with a passionate delivery that was well received with what appeared to be at least half of the convention hall standing and cheering with Dunbar signs. The expectations in the room are that we will need at least two ballots for the Congressional race, but with the withdrawal of Chaz Haywood, there should only be a maximum of three rounds. One other item of information is that Wendell Walker withdrew in the Central Regional Vice Chairman race, leaving Craig Storrs as the only candidate. 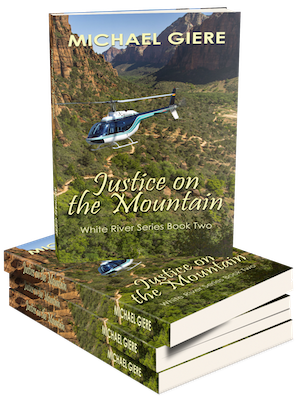 That leaves only the Northen Regional Vice Chairman race, the Chairman’s race, and the Congressional race as the three contested elections. 1:10 – We’re in the middle of candidate’s speeches for Congress and we have our first major move. 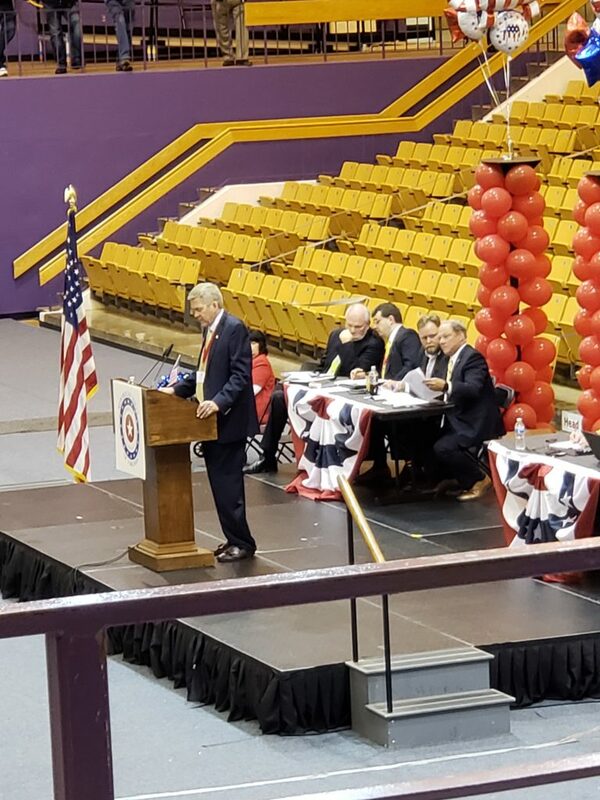 After Ben Cline gave the first speech of the 8 Congressional candidates, Chaz Haywood stepped to the podium and withdrew from the race, asking his supporters to vote for Ben Cline. This move was clearly designed to try and deliver a first ballot win for Cline. While the assumption is that multiple ballots favor Cline when it looks like it is Dunbar vs the world, multiple ballots also means higher attrition with the most committed delegates controlling the later ballots. With Dunbar appearing to control nearly 40% of the convention, and her supporters willing to stay all night, this was a big move. We’ll see if it pays off. 12:25 – After a recess for committee meetings, the convention was called back to order, and the reports of the credentials, rules, and nominations committee were given and their reports were adopted. With the adoption of the rules, the method of balloting has been set. After the first ballot for Congress, if no one has a majority, the bottom three candidate are dropped. If a second ballot does not produce a majority winner, the next two lowest vote getters are dropped. For every ballot after that, if no candidate has a majority the bottom candidate is removed. With eight candidates running for the 6th district nomination, that means there could be a maximum of 4 ballots (1st – 8 candidates, 2nd – 5 candidates, 3rd – 3 candidates, 4th – 2 candidates). 11:55 – While not official, TBE’s own Willie Deutsch has put together a spreadsheet to calculate the weighted voting. According to our back of the napkin calculations, Jack Wilson received about 62% of the vote versus 38% for Albertson. The question now is, how will Wilson’s support be split amongst the 6 campaigns that supported him? 11:25 – After a roll call vote, Jack Wilson is elected temporary chairman of the convention, and in a show of unity has appointed Steve Albertson as Vice Chairman of the convention. 10:50 And we’re off. Scott Sayre is leading us up to the vote for temporary chairman. The vote will be a weighted, roll call vote. 10:15 – Here is the weighting of all the localities in the 6th district today. 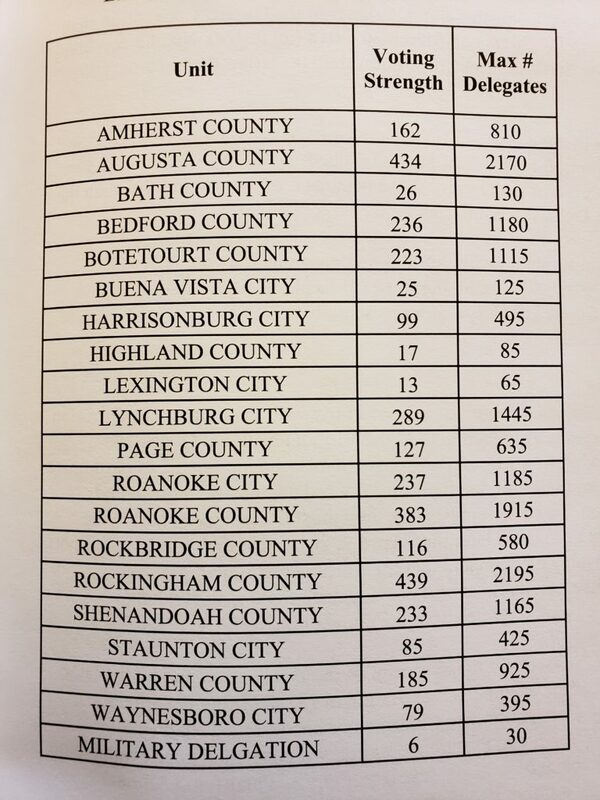 Rockingham, Augusta, and Roanoke counties are the big prizes, but with weighted voting you cannot ignore the smaller units. For example, if only 5 people show up out of Buena Vista City, they will command all 125 weighted votes, and they could all swing to a single candidate. 9:45 – The first test vote of the day will come early. The 6th District committee has put forward 1st District RPV rep., Steve Albertson, as temporary chair. 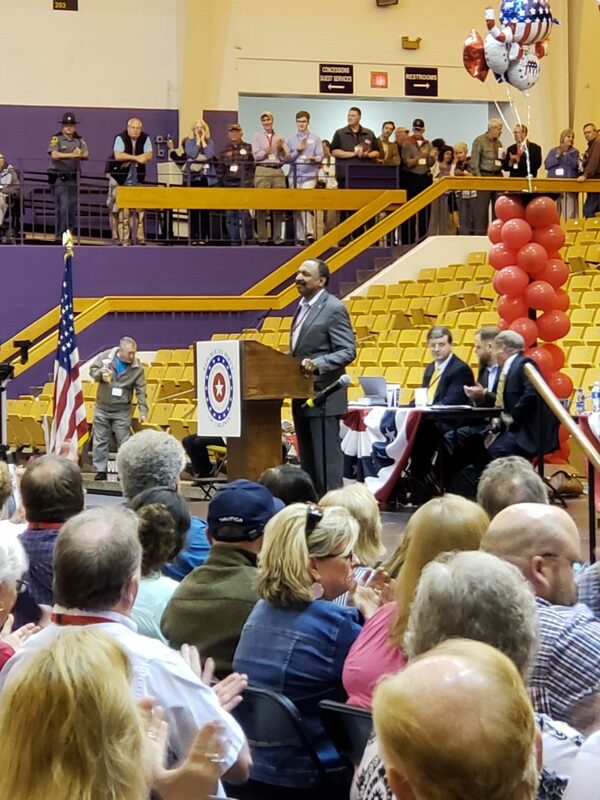 The Dunbar campaign appears to support this choice, while nearly every other candidate is backing Jack Wilson, who chaired the 2016 RPV state convention. If Albertson is elected temporary Chairman, it will be a pretty big signal as to how the rest of the day may go. 9:15 – Today is the big day in the 6th district. 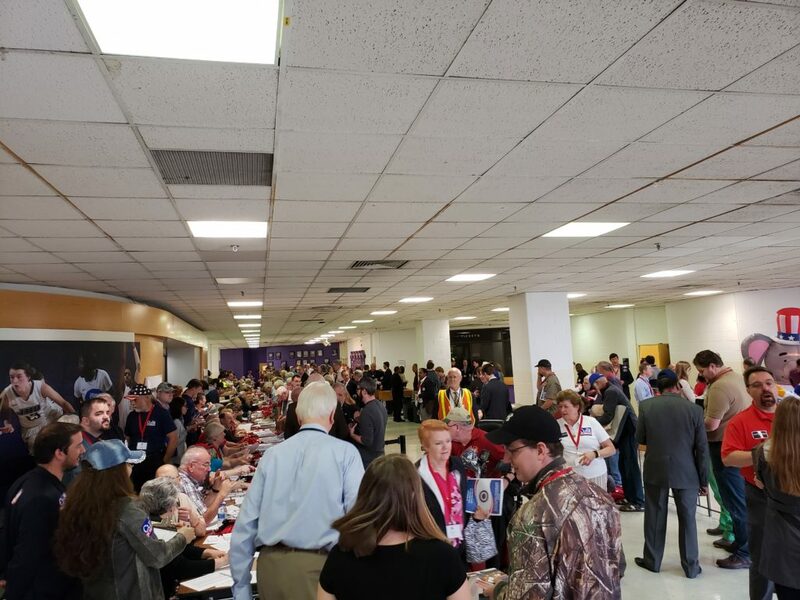 We still have about 45 minutes for delegates to arrive and get in line to check in, and the line is long and steady. Delegates will be checked in until the balloting for temporary Chairman has begun. The rain and bad weather has not appeared to affect the turnout. Fellow TBE blogger, Willie Deutsch, is here and will be giving reports, and I will be updating throughout the day with news and any information I come across. New posts will appear at the top and will push older posts down.